As one of the biggest blockbuster events of the summer, the Philadelphia Museum of Art will be hosting Discovering the Impressionists: Paul Durand-Ruel and the New Painting. This world-class exhibition will be open June 24 through September 13, 2015 in the heart of the city near our hotel. Inside the museum, just make your way to the Dorrance Special Exhibition Galleries on the first floor to see this stunning body of work. Take advantage of our one-night Impressionists Package to experience this special limited-time display and enjoy luxury accommodations in Philadelphia at Rittenhouse Square. As the only city obtaining this sprawling showcase, you’ll want to make your way to the City of Brotherly Love for an unrivaled collection of nearly 100 Impressionist paintings. Stroll the aisles of this very popular attraction to admire the masterpieces of Monet, Pissarro, Renoir, Degas, Manet, Cassatt and other notable talents. Overnight luxury accommodations for a spacious, elegant stay that includes stunning marble bathrooms, plush beds, upscale accessories, and modern amenities like free Wi-Fi access, a large flat-screen TV, and an iPod docking station to connect to your smart devices. Breakfast for two (excluding room service and Sunday Brunch) at our hotel. Find out for yourself why our Lacroix at The Rittenhouse was voted among the top ten best hotel restaurants in the country by USA Today and 10Best readers. Two un-timed tickets to the Philadelphia Museum of Art: Discovering the Impressionists, the centerpiece special event for lovers of art, culture and history. 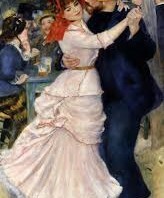 Dance at Bougival (detail), 1883, by Pierre-Auguste Renoir (Museum of Fine Arts, Boston. Picture Fund) Courtesy Museum of Fine Arts, Boston.